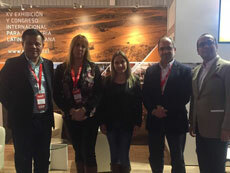 Armando Valenzuela participates with executives of EXPOMIN in the promotion of the XV version of EXPOMIN 2018 Exhibition and Congress at the EXPONOR 2017 in Antofagasta, Chile. Armando Valenzuela participated as a panelist at the round table on progress in the comprehensive analysis of the extractive sector of Latam and the EU in the 4th EU-Latin America Dialogue on Raw Materials, held on 08-09 May 2017 in Buenos Aires, Argentina. In the photo: Armando Valenzuela (AL Prospecta), Rocco Lagioia (ITRB, Belgium), Mattia Pellegrini (European Commission), Carlos Parada (EXPOMIN). Armando Valenzuela was the executive secretary of the First International Meeting on Mining and Sustainable Development "Impurities: Regulatory Trends, Markets and Technologies" held on April 6, 2017 in the framework of CESCO week. During the second semester of 2016, Armando Valenzuela gave the course "Commercialization and Marketing in Mining" to 5th year students of the Civil Engineering in Mining and Metallurgy of Universidad Andrés Bello (UNAB), Santiago. With success, AL Prospecta coordinated the XIV International Congress EXPOMIN 2016 (25-29 April 2016), which included 15 events with +100 speakers from 15 countries and more than 1,200 attendees. Additionally, Armando Valenzuela, Director of AL Prospecta is technical advisor of the EXPOMIN Exhibition since its IX version (2008). More details on www.expomin.cl and www.congreso.expomin.cl.